A defiant Russian President and the leaders of Crimea signed a treaty Tuesday reunifying Crimea with Russia even as the Group of Eight (G8) suspended Russia’s membership of the group. “More than 82 per cent of the electorate took part in the vote. Over 96 per cent of them spoke out in favour of reuniting with Russia. These numbers speak for themselves,” said Putin to thunderous applause from Russian and Crimean officials in the Kremlin on Tuesday. 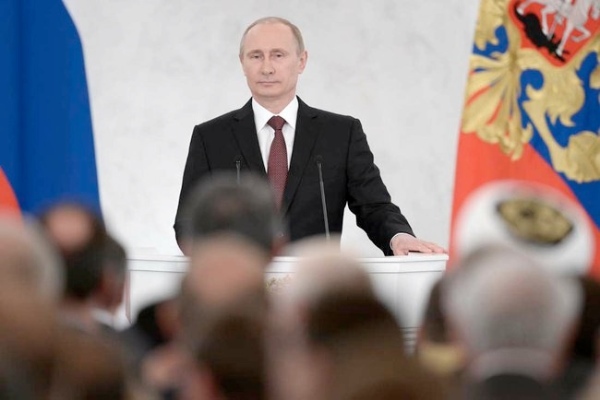 Invoking Russia’s “shared history and pride” with Crimea, Putin said the Crimean referendum is “in full compliance with democratic procedures and international norms”. The Russian parliament is expected to ratify the treaty later on Tuesday. Putin signed a decree Monday recognizing Crimea as an independent state, following a referendum Sunday that saw voters on the peninsula overwhelmingly support secession and reunification with Russia. Crimea’s leadership has refused to recognize as legitimate the new government in Ukraine that came to power following the ouster of President Viktor Yanukovych last month, instead declaring independence and seeking reunification with Russia.